A perfectly painted surface is every car's staple feature, and thus represents a very emotional measure of quality for the customer. To optimise this surface, two to four robot-assisted systems (depending on the cycle time) of the reflectCONTROL PSS 8005.D type allow objective in-line inspection of each car body. The defects are measured laterally and in depth, and classified on the basis of catalogues and optionally marked by the automationControl 8005 PSS 8005.MQ system using ATENSOR-LS1 technology*. This way, follow-up work and process improvements can be performed precisely as required and easily. *ATENSOR LS1 technology = robotic process automation for products with a high number of versions, which makes manual robot programming impossible. With the ATENSOR-LS1 (LS1 = lot size 1), robot programmes are dynamically generated on the basis of measurements. The programmes are then loaded and run in the robot memory. The automationCONTROL PSS 8005.M system is equipped with ATENSOR-LS 1 technology* and marks relevant defects that have to be reworked. According to the classification resulting from the inspection, different symbols are positioned accurately as markers. The reflectCONTROL PSS 8005.D system uses robot-controlled sensors that inspect shiny surfaces on the principle of the phase-shifting deflectometry. 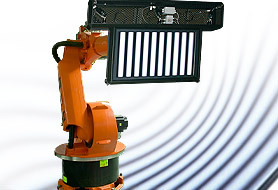 The robot tracks are defined offline by simulation with the aid of CAD data of the objects being inspected. Optionally, automatic defect marking can be performed with the automationCONTROL PSS 8005.M system.